Formerly known as Bulletin of the Pomor University and Bulletin of the Northern (Arctic) Federal University, the open-access peer-reviewed journal published by Russia's Northern (Arctic) Federal University (NArFU) recently changed its name to Arctic Environmental Research (AER) to accentuate its international relevance. Now, it also accommodates a whole set of novelties and innovations as a result of its move to the journal platform ARPHA. Its first issue in collaboration with the revolutionary publishing solution, developed by scholarly publisher and technology provider Pensoft, is already live on the journal's new website. To the benefit of authors, reviewers, editors and readers alike, the fast-track and convenient publishing workflow provided by ARPHA takes care for each manuscript all the way from submission and reviewing to dissemination and archiving without ever leaving the platform's singular collaboration-friendly online environment. Amongst the high-tech widgets at disposal to anyone who accesses an article in the revamped journal are the article-level metrics available thanks to the partnership between ARPHA and the revolutionary discovery and analytics tools Dimensions and Altmetric. By searching through millions of research articles, grant applications, clinical trials, as well as policy documents, news stories, blogs and social media posts, they allow for each article's references and citations in both the academic and the public sphere to be monitored in real time. 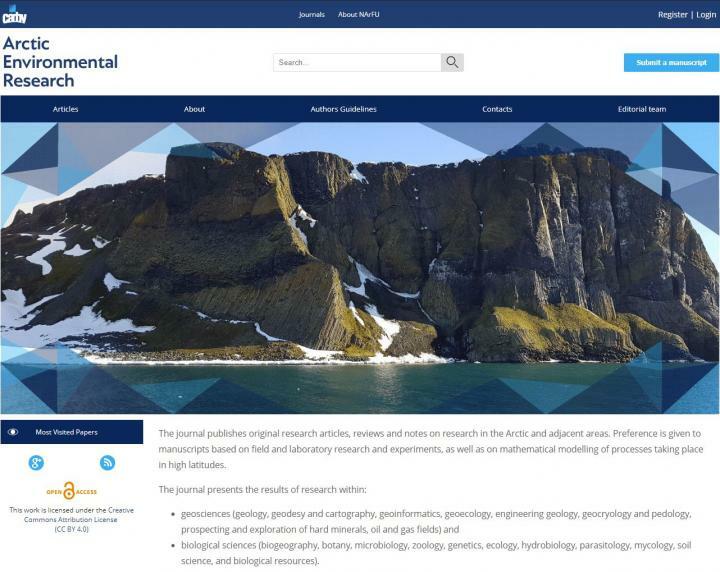 "I am truly delighted to welcome Arctic Environmental Research to ARPHA's family," says ARPHA's and Pensoft's founder and CEO Prof. Lyubomir Penev. "Being proven pioneers on the scholarly publishing scene in addition to our strong presence in environmental science, at ARPHA we believe that our white-label publishing solution makes a perfect match for forward-thinking institutions such as the NArFU and AER. "We are starting our cooperation with the scholarly publisher and technology provider Pensoft and moving to the journal ARPHA platform," says NArFU's Vice rector for scientific work and AER's Deputy Editor-in-Chief Dr. Boris Filippov. "We believe that it will help us fulfil the aims of AER, i.e. draw the scientists' attention to the most relevant, interesting, and promising areas of research in the Arctic and adjacent territories, as well as promote information exchange in the international scientific arena."